In this post, you will find helpful tips, preventive measures and fixes for overheating problems with the new iPhone 6 and iPhone 6 Plus. It's normal for iPhones to feel warm with prolonged use, when streaming videos, playing games, or downloading multiple apps simultaneously. By design, iPhones including the latest iPhone 6 and 6 Plus can normally operate up to 35 degree Celsius and should never get hot to the point that it would be uncomfortable to handle. However, some users of the new iPhones especially those who are living in a place that gets warmer than 35 degree Celsius have reported an issue in which their phone is overheating. Apparently, the environment's temperature is to blame in this case. But there are also other cases of overheating issues that are not associated with extremely hot environment. If you are one of those who are experiencing this same problem, we've listed some helpful workarounds to help you deal with it. You will know if your iPhone 6 is overheating when you are getting a message prompt saying, "iPhone needs to cool down before you can use it." If you are seeing this message, simply turn off your iPhone, place it in a cooler place and allow it to cool down for a few minutes or hours. By then it should function normally again. 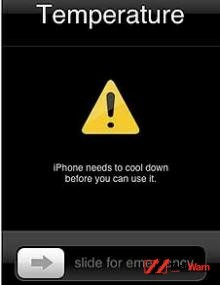 Overheating can also be due to your iPhone case. Some third-party accessories like the case may prevent your iPhone from cooling properly as your iPhone's exterior functions a cooling surface. To ensure this is not causing the problem, try to remove the case, otherwise, try to use a different case and see if that fixes that problem. If your iPhone gets extremely hot when charging or if it is plugged into anything, try to unplug it. There are also some iPhone 6 features that may trigger the device to get extremely hot or overheat. Among these include Bluetooth, Location Services, and iCloud. Try to turn off or disable these features temporarily and see if the problem persists. To disable Bluetooth, just go to Settings, and tap Bluetooth to toggle it OFF. To disable Location Services, go to Settings-> Privacy -> Location Services. To disable iCloud, go to Settings -> iCloud. Press and hold the Sleep/Wake button until the red slider displays. Drag the slider to turn the iPhone off completely. Once the phone turns off, press and hold the Sleep/Wake button again until the Apple logo displays. If your iPhone 6 still gets too hot, contact Apple Support and escalate the issue. It's possible that the problem is due to a faulty hardware or the device may be defective. Check out our http://stephaniefulke.blogspot.com /2015/08/Apple-iPhone-6-Troubleshooting.html" target="_blank">iPhone 6 Troubleshooting Page for more issues, fixes and troubleshooting guides on the new iPhone 6 device. we feel the information How to fix and prevent iPhone 6 Overheating that's all. hopefully the information How to fix and prevent iPhone 6 Overheating that we have conveyed can provide benefits for you and all visitors of this blog, if any criticism and suggestions please comment. you just read How to fix and prevent iPhone 6 Overheating if this article is considered useful and you want to bookmark and share it please use the link https://stephaniefulke.blogspot.com/2015/08/how-to-fix-and-prevent-iphone-6.html and what if you want other information look for another page in this blog.